Coulomb: I like your saying " Endeavor to persevere " reminds me of the Clint Eastwood movie where the old Indian had the piece of red rock candy that was not for eating, it was just for looking at. With all this amount of hours between you and Kenny and myself, don't want to get too anxious , and fire it up and blow up something else, especially since a lot of stuff has to be dug out of epoxy resin. I'll wait and see if Kenny has any additional feedback before I fire it up again. It is interesting that this IC and Resistor are in the output stage, which is were the two caps that were blown in the doghouse may be related. I'm wondering if the two faults are really related or coincidental. The reason I used a thru hole part instead of replacing the resistor with another SMD, was due to time. Out here in the West, They quote 5 days delivery for RS and Element14 deliveries from the Eastern States, but usually take a whole week, and then it takes another day or 2 on top of that to get it from Perth to my place out here past the black stump out in the bush. 1206 and 0805 parts are readily available from Altronics here, but the smaller 0603 parts take a bit longer to get in. The thru hole part I used is a higher wattage anyway, so with the leads, it won't be getting warm and de-soldering it self if that was the original problem. 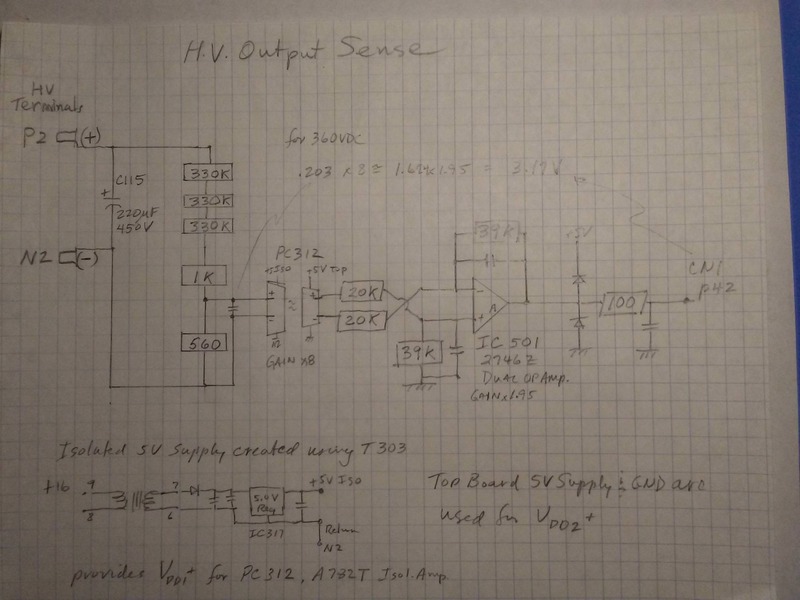 39k is a pretty high value so I can't really see this part getting hot though, but then again we are talking about 360+ voltages around the output stage in some cases, so 360v across a 39k resistor would end up being above 3w if something shorted. Maybe this resistor de-soldered itself and kept the smoke from getting released from somewhere else. You mentioned to check for burnt pre-charge resistors. Are you talking about the two 4.7R resistors that get shorted out when the relay closes? The values on those seem ok via measuring through the EMI Filter, and they did not appear to be burnt. Kenny also mentioned way earlier that he spotted a current sens resistor that looked a bit discoloured in one of my pictures. Kenny can you remember where this is and point it out to me again so I can measure it and confirm that is also ok? That is a very important circuit, and that resistor is too. i think i made a post several pages ago about those two big chips that are jumping across the isolation slot cut in the circuit board, PC312 and 313, which are Broadcom A782T isolation amplifiers [with fixed gain of ~8x] used to measure the OBC output voltage and current. These feed into the small IC501 2746Z op amp which sends the signal back up the CN1 cable to the top board. The output current is read across R232 which is near the base of the output filter cap, C115. The board looked scorched to me in one of your photos, the resistor is probably okay. The OBC High Voltage output is divided down on the bottom side of the bottom board thru a series of 330k resistors, R431,432,433, this is then fed thru another voltage divider on the topside of 1k and 560R into the PC312 differential isolation amplifier. The differential amp will reject common mode noise on the buss line and provide a clean signal representing the voltage of the output, or across the current sense resistor in the case of PC313. The differential output of the isolation amp is fed into a non-inverting differential input-to-single output stage with a 39/20 = 1.95 gain from the IC501 op amp. 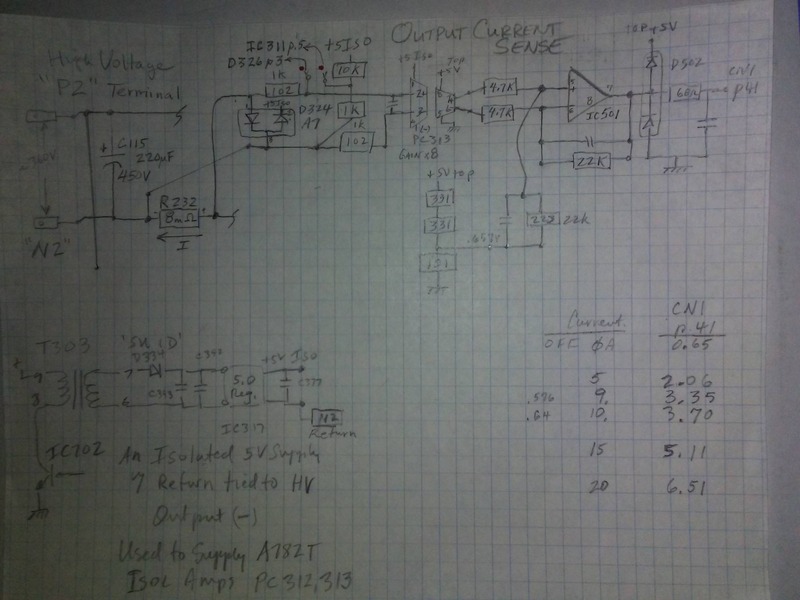 Using 360VDC as the charger HV output, the input to pin 2 of the isolation amp will be about 200 mV, and with a gain of 8 the output will be 1.6V. This is then fed into the 2746Z op amp and results in ~ 3.12V signal that is sent over the CN1 pin 42, likely as input to the microcontroller, but i haven't traced that far yet. With the twisted sister resistor going open circuit, then the op amp becomes a non-inverting follower with a gain of 1+(39/20) = 2.95, and now the output goes to ~4.72V, nearly to the 5V rail. The diode circuit on the ouput would clip that back down a bit, but the microcontroller would be seeing an abnormally high voltage reading. We don't know what it would do in response, but most likely shut down the FETs in an attempt to lower the HV. It may be a sudden shutdown could cause the snubber capacitors in the potted doghouse to see a massive overvoltage and this may have caused them to blow. Here is the current sensing circuit also, which uses the other isolation amplifier that bridges across the gap in the pc board. When the OBC is on but no current flowing, then the CN1 pin 41 voltage will be about 0.65V. When the current is 9 Amps, then the top board will see 3.3V. At higher currents the voltage goes up until it will be clipped, but the microcontroller will likely take action above 9A to limit it, since that is pushing the limits of what can be done with a 3.3kW charger (360V x 9A). Last edited by kiev on Sun Aug 12, 2018 11:41 am, edited 3 times in total. "The output current is read across R232 which is near the base of the output cap, C115. It looked scorched to me in one of your photos." The writing on the part looks like BL 00 What value do you think this resistor should be? skylogger wrote: Out here in the West, They quote 5 days delivery for RS and Element14 deliveries from the Eastern States, but usually take a whole week, and then it takes another day or 2 on top of that to get it from Perth to my place out here past the black stump out in the bush. I had to order some other parts from RS Online today (for another charger, as it happens), so I added two packs of 50 0603 39k resistors. If you like, PM me your street address and I'll post one packet to you. I forgot to add GST to the 15c, so it's really 16.5c. Plus a dollar to post, if as I suspect they fit into an ordinary envelope. You might decide one day that an SMD part actually looks better. And you can practice SMD soldering, and not worry if you lose one. Or ten. That is 8milli Ohms, 0.008 Ohms. It is probably a metal resistor and not damaged at all, but the circuit board in its vicinity looks to have gotten hot and discolored. kiev wrote: That is 8milli Ohms, 0.008 Ohms. That's another use for current limited power supplies. I set mine to about 5 V and 3.0 A; mine is digital and surprisingly accurate. I put it across the shunt, such that all the current from the power supply flows through the shunt. Then I use my multimeter on the millivolt scale to measure across the thin wires that run away from the shunt. That's a "Kelvin" or "four terminal" connection, and measures the resistance that the charger will actually see. In this case, you'd hope to read around 24.0 mV (V = I×R = 3.0 × 8.0, with both voltage and resistance in milli-units, but the current in whole amps). skylogger wrote: The writing on the part looks like BL 00 What value do you think this resistor should be? One of Kenny's diagrams shows "8L00". Kenny: can you explain how you get 8 mΩ from 8L00? The codes I know would show R008 or 008 or ̅0̅0̅8̅ . So I decided to bit the bullet, and re-install the charger back into the car and test it out. Once I got through fitting it, I turned the key and car went to "READY" with no errors on Dash. particularly since it was sitting for a week without a charge. bars down when I started, and after 20 minutes I could see that the fuel gauge had moved up one bar. So all is looking great so far. wrecked I-MIEV fully working again, I can use it to run through this process on it before we do it on his car. a fully working charger as a reference. Perseverance Pays Off in Successful Repair! Way to go Larry, great job on getting it fixed--and thanks for the offer for additional diagnostic testing. And now we have some clues of where to look when the snubber caps are blown, such as in Jay's charger. i think the burnt by-pass resistors such as in 1pk's case will be a different culprit.